My first full day in Ko Yao Noi, I was hoping for a fun no-adventure snorkeling tour, an A-side full of shareable photos that would trigger the jealousy of friends and foes alike…but instead I got another B-side for the collection. I guess it’s because it’s shoulder season here in Southern Thailand, but I was not able to get a place on any boat doing the famous 5 island snorkeling tour for a very reasonable 500 baht. Not that they were all booked – quite the contrary, none of the operators in Pasai Beach seemed to have received any interest from anyone but me. So I settled for a more local plan, taking advantage of the location and facilities of my guesthouse. First I woke up early for a sunrise walk on the beach which, while essentially stunning, confirms my feeling that I’m not a sunrise type of person. Back to the bungalows for breakfast, I asked the friendly owner, Mr Ling, for kayaking advice. “Two hours there and back”, he said reassuringly. Yes, yes. And in Paradise Bay. And in Long Beach. I had ridden my bike to Long Beach the day before, only to find a stretch of mud leading to shallow waters. The pitfalls of low tide, I reckoned. After I finished breakfast, Mr Ling showed me to the kayaks and handled me the gear. I started paddling at around 8.50. It was already hot, and I was surprised at how long it took me to get past (under, to be more precise) Tha Khao Pier. I felt my arms itching from exposure to the sun – maybe I should have put on some more sunscreen, I thought. Drenched in sweat, I stopped at the first beach I saw for a quick swim. It was not entirely wild, but seemed to belong to a very primitive, perhaps abandoned resort. I was the only one around. I enjoyed the depth and coolness of the water, so much better than in Nopparat Thara or even Railay West. 20 minutes or so after resuming the paddling, I started feeling weak. Not weak with cramps from muscle fatigue, not out of breath, but a “deeper” kind of weakness, as if I could pass out at any moment. I planned – I just had to get to Long Beach, where there was a rustic bar and a road from which I could get picked up if necessary. But there was still some way to go, and now I felt my body crying, please stop. I stopped paddling, and steered the kayak toward the shade provided my a lonesome tree in the water. The coastline turned inward, forming a bay, and I saw a local fisherman on a longtail boat, which relaxed me a little bit. Eventually I made it to another small and beautiful beach, this one quite close to somebody’s house. As I stood on the sand to drag the kayak, my belly got all stiff with abdominal cramps. I found a shade under a tree and lied down. But I was feeling very hot, so shortly after I dipped into the cool water. God, thanks. Recovering some power took a little time. I munched some 7-Eleven oatmeal cookies, an habitual travel companion when in Thailand, but was not feeling hungry. I drank some more water. I looked around: the beach was solitary, idyllic, save from some trash on the sand – bottles, cans, and nondescript plastic debris. This is the state of things, I reflected. We humans pollute, then clean only the stretches of sand of the resorts where we stay. How selfish, really. At this point it was clear in my mind that Long Beach was to be the final destination of my trip, so I gathered some courage to cover the last stretch of coastline. 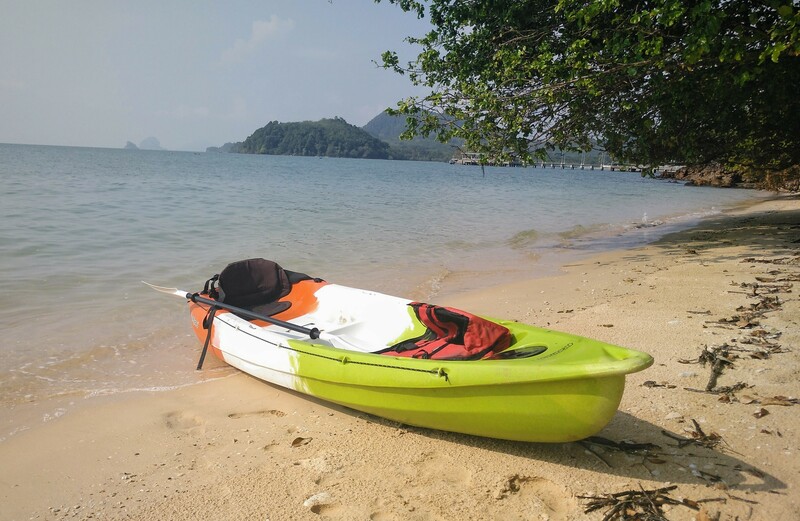 And soon enough I was there, parking my kayak on the beach as if I was Paul Theroux on one of his paddling adventures, yet too tired to enjoy the jealous eyes of the dozen or so swimmers and sunbathers. It didn’t take me long to make it to the rustic beach bar and get a cold can of Coke. Caffeine, please. I sipped the liquid sugar, relaxed and shortly after everything unfolded according to plan: I called my guesthouse, was passed to the member of staff with the best English, and this nice woman called a taxi that would pick me up in half an hour. “And the kayak, too” I reminded her. “Ka. The kayak too”, she answered politely. The taxi driver came in his songthaew and offered me a big smile as I helped him load the kayak inside. He had brought three kids along, the youngest of which was sporting a Buriram United football jersey. When the time came to drop me off, he refused payment. “The resort take care”, he said in broken English, pointing up the hill to the bungalows. Once up the stairs, the overweight resort staff member (presumably, the nice lady’s husband) refused my offer of payment for the ride with a surprised smile. So it went, and cheers to the hordes of tourists who fill travel forums with complaints about how money-obsessed Thais can be. I am writing this just a few hours after the kayak ride, and still feel weak despite a replenishing lunch complete with a mango shake. I wonder, what got in me? Dehydration? A heat stroke? Inefficient paddling mechanics leading to exhaustion? Or, more likely, lack of sleep topped by too many sips from my flask of SamSong as I was enjoying a late night of texting and enjoying the jungle noises? I hear kids voices, too loud to belong to farang kids. Three kids, the smallest and cutest wearing a Buriram United T-shirt. Are they the kids of the overweight staff member and the lady who speaks the best English on site? The grandkids of Mr Ling, perhaps? The thoughts and calculations of someone who’s brain is working at maybe 40% of its power. So no, in the end I didn’t make it to the Kudu islands. Not even as far as Paradise beach. Too bad. There will be more occasions to secure those instagrammable photos, I suppose. I’ll have to live with the fact that I’m no Paul Theroux at paddling (or writing, for that matter) – but still, there’s a lot of fun to be had in trying!